Newseum Institute Fellow Jill Geisler leads a discussion at the Newseum’s Power Shift Summit on Jan. 9. Today, the Newseum released a report on its groundbreaking Power Shift Summit held on Jan. 9, in which more than 130 newsroom leaders, editors, reporters, educators and advocates participated. The report, “The Power Shift Summit Report: Ending Silence and Changing Systems in the Media Industry” identifies seven key Power Shift Principles, lessons learned from the summit about workplace imbalances that protect the powerful and intimidate and silence others, especially young women. The report found that sexual misconduct and workplace discrimination are inextricably linked, workplace incivility and bullying are gateways to harassment, and change must be remedied through strong harassment reporting and training systems combined with women’s leadership, supported by both men and women at all levels of an organization. In addition to identifying problems, the Power Shift Summit was convened to generate a solutions-based discussion about what newsrooms and media organizations are doing now to deal with emerging cases of sexual misconduct. The report calls for the repair of systemic failures, including the ability to report misconduct without fear of retribution, harassment training for employees at all levels of an organization, and a human resources process that is free from apparent and inherent bias. Read the complete report. 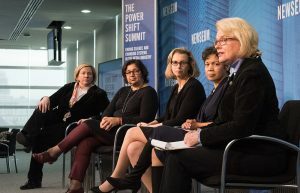 Capitalizing on the momentum generated by the summit, the Newseum Institute is launching the Power Shift Project, a major new initiative on behalf of women in the news industry. Jill Geisler, the Bill Plante Chair in Leadership and Media Integrity at Loyola University Chicago, will help guide the Power Shift Project as the newly appointed Newseum Institute Fellow in Women’s Leadership. Geisler is an internationally recognized expert in leadership and management, and she is the author of “Work Happy: What Great Bosses Know” and “News Leadership at the Head of the Class.” She also writes a monthly management column for the Columbia Journalism Review. The Power Shift Project’s initiatives will include a series of live events from the Newseum with experts who will provide training and tools to a variety of audiences on key issues related to harassment and discrimination. The project also will include a #PowerShiftPledge challenge for journalists, newsroom managers and senior leadership, asking them individually or as a company to “support a workplace where all are free from harassment and empowered to succeed.” The pledge stands for workplace integrity, where strong reporting and training systems combine to eliminate sexual harassment and workplace misconduct, with a goal of encouraging and supporting opportunity for all. This entry was posted in News and tagged Diversity, journalism, leadership, media, Power Shift Project, women's rights by Stephanie Castellano. Bookmark the permalink.